Weathermaker Music, the label owned by touring juggernauts Clutch, has inked a multi-year, multiple release North American deal with Sony/BMG owned RED Distribution. 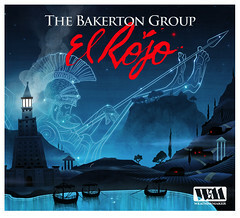 First on deck, slated for a February 17th release through the formidable alliance, is the new BAKERTON GROUP release entitled "El Rojo!" Produced by Clutch and J. Robbins at Magpie Cage Studios in Baltimore, MD, "El Rojo" will be the first full tilt release from THE BAKERTON GROUP, the psychedelic instrumental jazz-laden alter ego of Clutch (all 4 original Clutch members make up The Bakerton Group). In addition, Per Wiberg from Opeth was brought in to handle all piano, synth and keyboard duties on all 10 of "El Rojo's" tracks. In other Clutch related news, some of the incredible footage from the band's first ever live DVD/CD, "Full Fathom Five," will be featured on Comcast Cable's On Demand "Concert TV" channel starting December 15th, along with classic rock icons Led Zeppelin, Judas Priest, Black Crowes, Deep Purple, Santana, U2 & Motorhead. “Clutch have so many fans here at RED, and we couldn’t be happier they chose us to be their distribution partner... Helping the band build their new label will make 2009 an even better year at RED.” - RED Senior Vice President of Product Development Alan Becker. "We're so amped about our deal with RED. I'm convinced their team is as hungry as we are to take The Bakerton Group, Clutch and Weathermaker Music to the next level." - Weathermaker Label Manager Jon Nardachone. Listen to snippets of two tracks from El Rojo now! The Bakerton Group will hit the road in support of El Rojo. Joining the group on the road will be Red Fang. Then as a special treat, Clutch will perform a full set and headline each night of the tour. This is your chance to see both The Bakerton Group and Clutch music performed live together! Hi, I'm looking for information about Snake wine, do you have any ? I found your website on Google when searching other shops to buy Snake liquor but I can't find any more information here.